Another aspect of ALS is the occurrence of cognitive decline in a proportion of individuals with the disease. This can manifest as a mild cognitive impairment in about 30% of cases, and moderate to severe impairment in about 20% of cases, with severe cases meeting the criteria for a diagnosis of Frontotemporal Dementia (FTD). Based on this, it is currently considered that ALS and FTD may be a continuum of the same underlying disorder. Approximately 5-10% of cases are genetically inherited (Familial ALS or fALS) with the remaining 90-95% of cases occurring sporadically (Sporadic ALS or sALS), with no known cause of disease. The most well established cause of fALS is mutations in the gene encoding copper-zinc superoxide dismutase (commonly known as SOD1), responsible for approximately 15-20% of fALS cases, which corresponds to about 1-2% of all ALS cases. 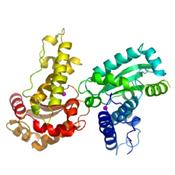 SOD1 is a ubiquitously expressed enzyme that acts by removing toxic superoxide radicals generated via normal biological processes, and that can cause harm to the cell. Over 100 different mutations have been identified in the SOD1 gene. It remains unclear how these mutations cause the disease as in most cases normal SOD1 enzymatic activity is not affected. Therefore, disease is not caused by an inability of SOD1 to remove toxic superoxide radicals. Instead the mutations appear to impart a gain of toxic function to the SOD1 protein. The nature of this toxicity remains unknown but may be linked to the increased propensity for mutant forms of SOD1 to misfold and to aggregate. Other genes associated with ALS, but less well established, are Alsin (ALS2), Senataxin (SETX), and Vesicle-Associated Membrane Protein B (VAPB). These genes cause less typical forms of ALS. Mutations in the genes encoding Angiogenin (ANG), Dynactin-1 (DCTN1), Neurofilament heavy subunit (NEFH), or Peripherin (PRPH) appear to increase the risk of developing amyotrophic lateral sclerosis. Recently, mutations in the gene encoding TAR-DNA-Binding protein (TDP-43) have been found in fALS and sALS cases.